After graduating from high school, Sue Zurin became a payroll & billing clerk at Gerberich-Payne Shoe Co. in Mount Joy. 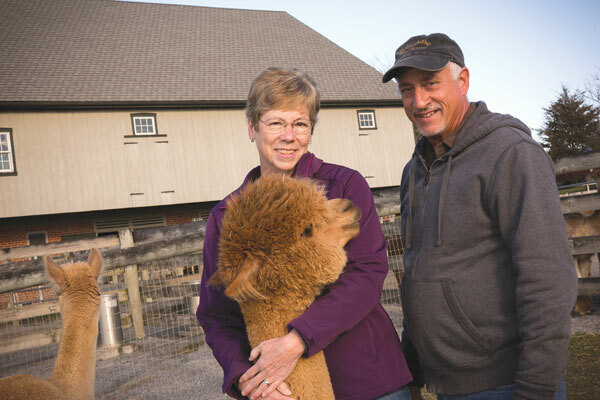 Now, she handles the books for her own business — Eastland Alpacas, a venture she shares with her husband of 42 years, Kevin Zurin. If you were to go online to Trip Advisor and research Eastland Alpacas, you would see a five-star rating. 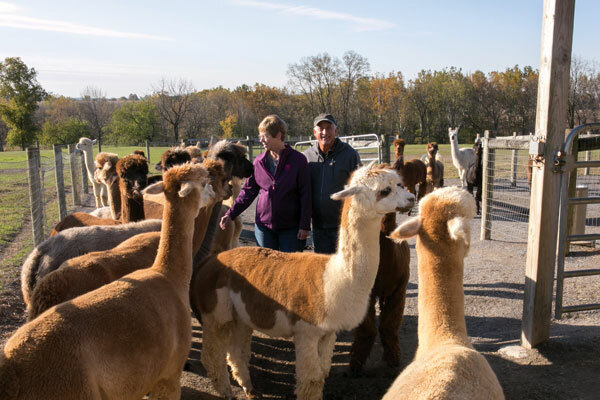 It seems people just love visiting Sue and Kevin’s alpaca farm in Mount Joy. Alpacas are known for their gentleness, docility and cuteness — not to mention their fleece or “fiber,” which is used to make incredibly soft yarn for items like clothing, rugs, etc. 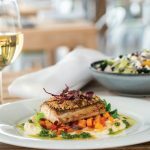 Their popularity has soared in the United States over the years. It was 15 years ago that Kevin approached Sue about purchasing alpacas for their farm. 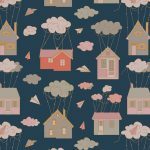 Their youngest child (of three, two girls and a boy) was graduating from high school, and Kevin figured it was a good time for two empty nesters to do something fun for themselves. Plus, they had just built a spacious new barn. 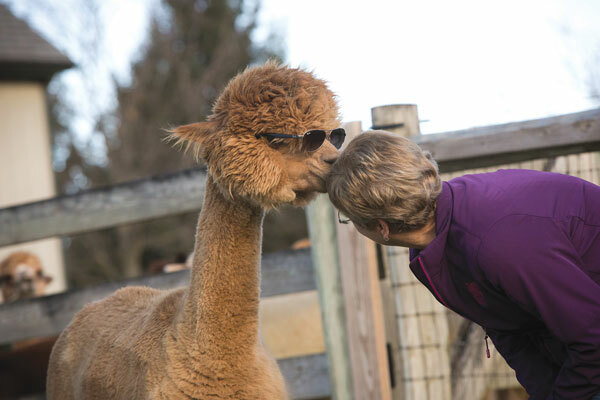 Sue was game, but after learning out how much a female alpaca would cost, she balked, saying, “No way are we spending that much money on an animal!” At the time, alpacas were considered exotic animals, and a female could range in price from $12,000 to $30,000. Today, however, they are regarded as livestock. In 2002, Kevin read in the newspaper about two males for sale and persuaded Sue to check them out. The rest is history. They started out with two non-breeding pet males just to see if they would like them. “After we purchased them we realized we didn’t like them – we loved them,” Kevin says of the lovable and huggable animals. “It is calming to be around these peaceful creatures,” Sue shares. Seeing alpacas grazing in Lancaster County fields was a novelty at the time. Sue remembers how cars would drive by Eastland’s pastures and slow down or even come to a complete stop. “I’m surprised we never had an accident out front due to onlookers,” she remarks. 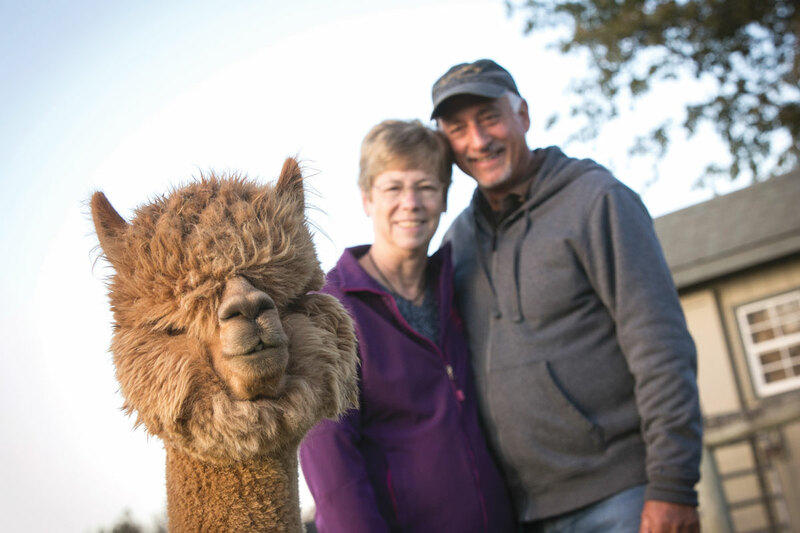 Kevin and Sue eventually purchased female alpacas, which arrived already bred (and came with a free re-breed offer). They gradually invested in other females in order to begin building a herd. Over time, they also invested in several stud alpacas. It took about five years to develop a good-sized herd. Today, the herd numbers over 100 alpacas, with more being added through births. “A cria is a baby alpaca,” Sue explains. The gestation period for an alpaca is 11-12 months. Mother and cria communicate by means of a low, gentle hum. 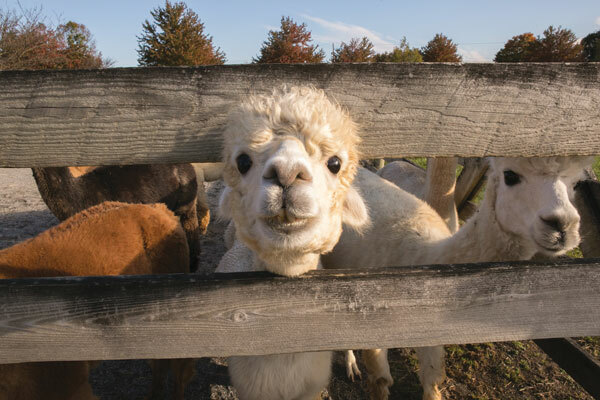 If a grown alpaca gets annoyed with another alpaca, he or she will make a little squeal or they may have a “spit battle.” It is a misconception that an alpaca will spit at people like llamas are reputed to do. Sue and Kevin also have two llamas. They are mainly used for educational purposes and to demonstrate the differences between llamas and alpacas. The llamas are bigger animals and weigh 260-360 pounds, whereas the alpacas are smaller and weigh between 150 and 200 pounds. They’re also much easier to handle, especially at shearing time. Both breeds are sheared once a year, in the spring, which helps them to tolerate the summer heat. The Zurins host an open house the first two weekends of November as a way of educating people about alpacas. During the event, attendees can tour the farm, view the animals and participate in activities. The whole family helps with this event, as do friends. In 2016, more than 8,500 people attended the four-day event. 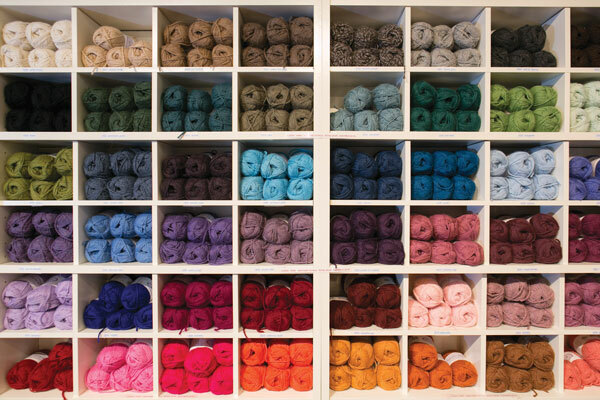 Sue’s favorite part of the business is operating an on-site store, which she stocks with a wide variety of items made from alpaca fibers: sweaters, gloves, jackets, scarves, hats, socks, sofa throws, rugs, yarn, and the list goes on. The store is open year-round – January through October by appointment, while regular hours are maintained Monday-Saturday, 10 a.m.-4 p.m., and Sunday, 1-4 p.m. throughout November and December. 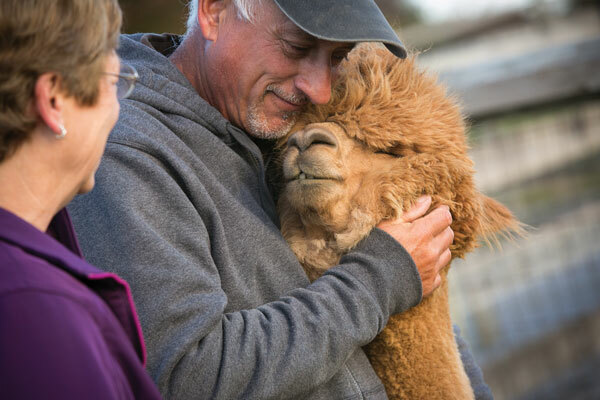 “The hardest part of raising alpacas is parting with them when they are sold,” Sue confides. However, she takes comfort in knowing the animals are going to good homes. 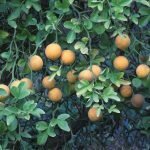 In fact, the Zurins remain in contact with the buyers long after their “babies” leave the farm. For more information, visit eastlandalpacas.com.